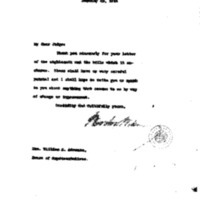 Woodrow Wilson thanks William C. Adamson for his letters regarding Interstate Commerce Commission. Thank you sincerely for your letter of the eighteenth and the bills which it encloses. These shall have my very careful perusal and I shall hope to write you or speak to you about anything that occurs to me by way of change or improvement. Wilson, Woodrow, 1856-1924, “Woodrow Wilson to William C. Adamson,” 1914 January, WWP18301, First Year Wilson Papers, Woodrow Wilson Presidential Library & Museum, Staunton, Virginia.